Recess and lunch can sometimes be a time of strife for me. I have had classes before where every.single.time I came back from the short break to a swarm of children just waiting to tell me every little thing that happened on the yard. Seriously, that gets very old, very fast. So one day, while browsing the web, I stumbled upon something that I thought was genius...and I adapted it to work for me. 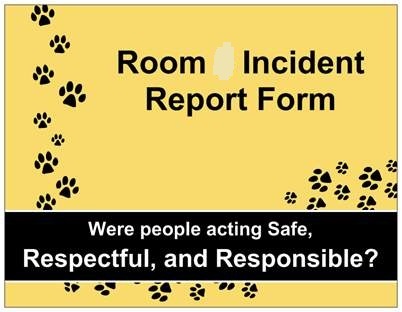 It is the "Incident Report Form". 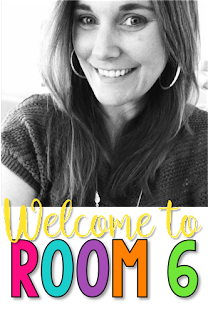 It came from Whole Brain Teaching (which, at the time I found it was called Power Teaching and had a much less daunting website...possibly because PT was in it's infancy and just growing at the time.) This was a simple little form the students fill out when they come off the yard and have something they want to tell me. 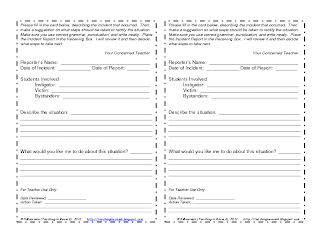 Here is the form that I put out for my students. It is uber-simple. It asks the students to tell me when the incident happened, who was involved (using the language of "bullying" we learned in our bullying unit), what exactly happened, and MOST IMPORTANTLY what the reporter would like me to do about it. 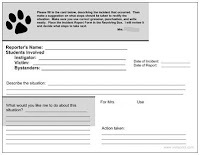 When a student has something to tattle tell me about from the yard, instead of running up to me, they grab a form (which I have located right next to the door), take it back to their seat and fill it out. The student then places it in the Receiving Box (located right next to the forms) and that is that. I look at it within 24 hours and deal with it accordingly. I have to say, since doing this a few years ago, tattling has all but stopped in my room. The students either decide that writing it out is worth it, or the incident wasn't all that important. Now, if someone is bleeding or hurt, they know to tell me immediately, but otherwise, these forms have been a blessing. What do you do to combat tattling in your class? Love it! Recess can become such a headache! p.s. I L-O-V-E Vista Print! 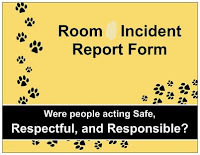 I love the incident report!!! What a great strategy. I don't have much of a tattle case in middle school maybe because they're a bit older and tend to keep more to themselves. I've seen elem. use a stuffed bear that the kids can go to, to tell their stories. I have GOT to use this! I teach 6th grade and my GIRLS stir up soooo much drama!! Especially since Christmas break. LOVE vista print :) tattling is a HUGE issue in my class, we have a tattle bag and that has helped a lot since the students do not want to take the time to write each tattle out.. however, unstuctured times like lunch and recess, they feel the need to want to tattle all the time! Most of my kids aren't too into tattling since I really push for them to handle things themselves and they usually do, but this could have come in handy in the past and may possibly again in the future. Thanks for the idea. I'll probably end up doing this on VP too! LOVE IT! I love to read "The Bad Case of Tattle Tongue". It's a fabulous story that is very kid-friendly. We've read it at our school with classes from P-9 with great results. Love it! I have 2 tattlers n we're going to 5th grade together! This will be implemented in Aug. I used a similar system when I taught 5th grade. Not only was it a great way to cut back on the INSANE after-recess drama, it also provided us with the ever-important documentation. It didn't solve the problem (it took a change in administration to do that) but it made it more manageable to sort out the problems. If it was a case of bullying, we would have all the witnesses write out their side of the story in different parts of the room, then we could compare the accounts to see what was similar in the stories. All the forms were then filed in a binder and copies were given to the office if necessary. I guess I got that incident form from you to use last year...and never did! Two years ago, literally every single recess and lunch time there was an issue, and it was driving me crazy! 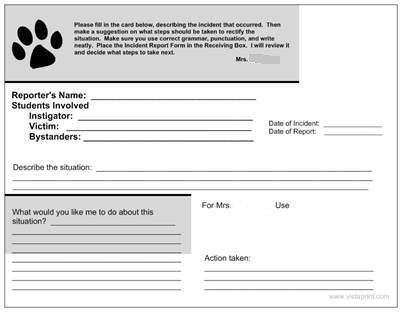 I searched around for something to do, found your incident report form, and was determined to have the kids use it. But the new class was 180 degrees different. They never even had an issue to report. Seriously. It blows my mind. I have them ready again for this year, and will use them whenever needed. Homework Excuse Forms...now that's what I used a lot! Saw them on pinterest. 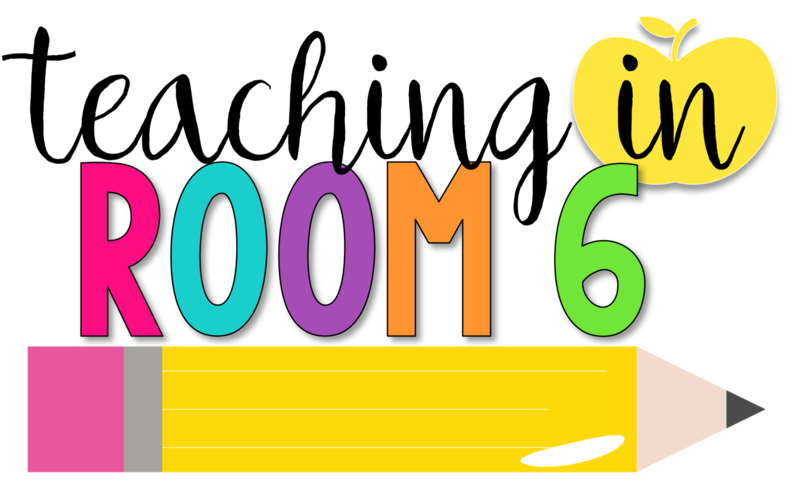 The students have to write down the name of the assignment, their name, date, and check next to their excuse for why they don't have the assignment turned in, and write what their action plan going forward is. Came in handy several times last year! A few parents or babysitters wanted to know what what going on, so I grabbed the binder, flipped to the student's name and showed the excuses. Such a life saver!